Most of my childhood memories were hazy but one thing I can vividly remember is that whenever we go out for malling, my mom would leave us with our yayas at a toy store, amusement park or arcade so that she can shop for kitchen wares. She loves kitchen wares so much that half of our house is occupied by shelves filled with kitchenwares. One of her favorite brands is Luminarc. So I was quite excited when I was invited for an intimate dinner to get to know more about Luminarc. 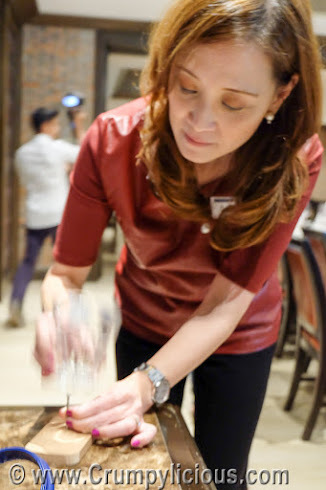 As showed by the host Ms. Nina Daza-Puyat of Appetite Magazine, Luminarc can withstand being hit by a nail, jumped and stepped on or hit by a metal ball. Everyone including myself tried doing it for ourselves and all of us failed to break it. I guess I inherited the interest from my mom. New kitchen products, gives as a jolt of excitement. Everything that was served looked more enticing because of Luminarc's Dinner Series. The healthy green Valle Verde Soup looks good right? And, the Farfalle and Grilled Vegetable Salad with Italian Dressing is just as lovely and also as delicious! An interesting dish that was served by Cafe 1771 is the Salt Crusted Fish with Bean, Thyme, Lemon, and Extra Virgin Olive Oil. But, the star of the night was the Corned Beef Brisket with Cabbage, Marble Potatoes, and Baguio Beans. This is actually the famous Pot-au-feu french dish that I became acquianted with from watching a Japanese drama called "Mondai no Aru Restaurant". This dish appeared so often in that series that made me dream of trying it. Finally, I have! The Luminarc Vitro Blooming cookware was also introduced to us. It was amazing! Vitro-ceramic can withstand temperatures from -40 Degree Celcius to 800 Degree Celcius and to tolerate fluctuations in temperature (up to 380 Degree Celcius). The initial application of vitro-ceramic was originally used in partnership with NASA, for use on the exterior of space shuttles. You can take it from the freezer and then directly cook: boil, stew, steam, fry, roast and grill or whichever way you want. Then, you can just return it back to the fridge for storage. Luminarc Vitro has a warranty of 10 years that covers manufacturing and quality defects subject to usage in accordance to the use and care instructions. It does not cover wear and tear resulting from the normal aging of the product. Luminarc Vitro is produced with the latest technology and made from pure and natural materials with extremely fine pores, anitbacterial, odor and stain free. I think I have found my new kitchen favorite partner with this!